Leviton Renu® 1-Pole 3-Way digital universal dimmer has voltage rating of 120-Volt AC at 60-Hz. Dimmer in white on white color, has incandescent load capacity of 600-Watts, MLV load capacity of 600 VA and LED/CFL load capacity of 300-Watts. 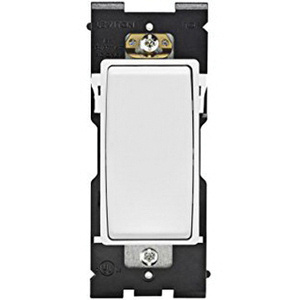 Wall box mountable dimmer measures 1.75-Inch x 1.4-Inch x 4.54-Inch. It has slim housing that easily fits into a standard wallbox. Dimmer operates at temperature range of 0 to 55 deg C. Universal dimmer is UL listed.